Day 02 was somewhat different. 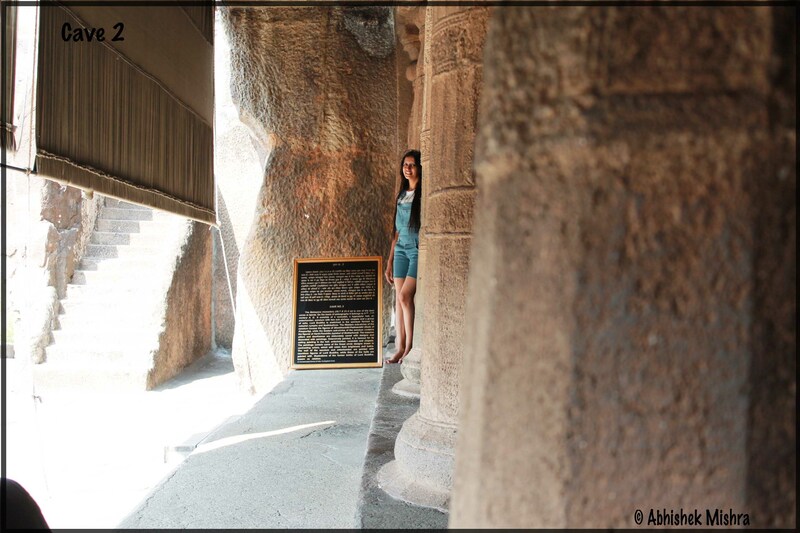 We felt familiar to this new to us yet very old city: Aurangabad! There is a good tea stall outside Hotel 7Apple Pvt Ltd, we enjoyed our morning tea for 4 days. You can think of giving it a try! 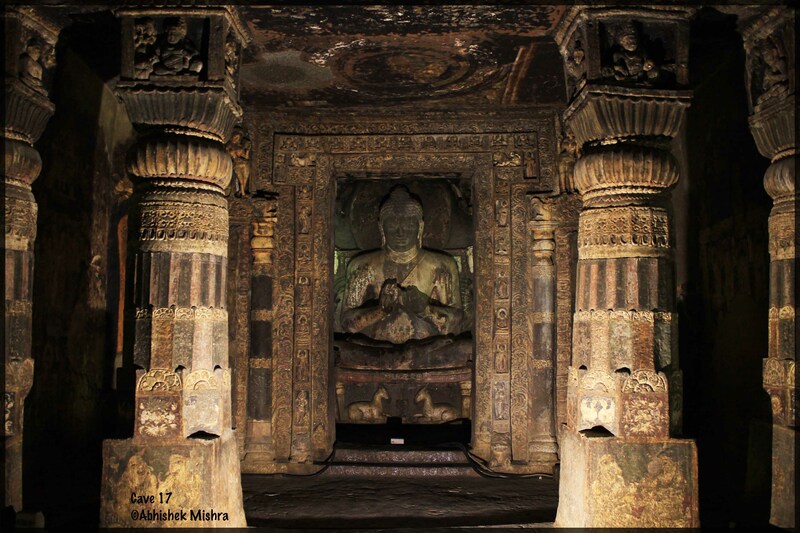 Ajanta Caves is nearly 110 kms far from Aurangabad. Roads are not that good. I really fail to understand, literally, majority of roads in Aurangabad are in pathetic condition and this road is no exception. I wish things will improve soon. (a). Dedicated MTDC tourist AC bus starts at 0830H very morning (except Mondays as Caves remain closed on this day). Bus fare is Rs 602 per head. Roads are not that good and it becomes further more painful as govt bus drivers keep chasing their time plan. (b). One can also hire car for the trip. Although hiring car will be costlier but definitely comfortable. It can cost from Rs 2000 to Rs 2200. Arif Bhai (Mob: 09665337660) can be a good option! (a). Rs10/head as gate pass which will be collected at entrance of Ajanta Complex. (b). Ticket of Rs30 per head will be collected at ticket counter. (c). 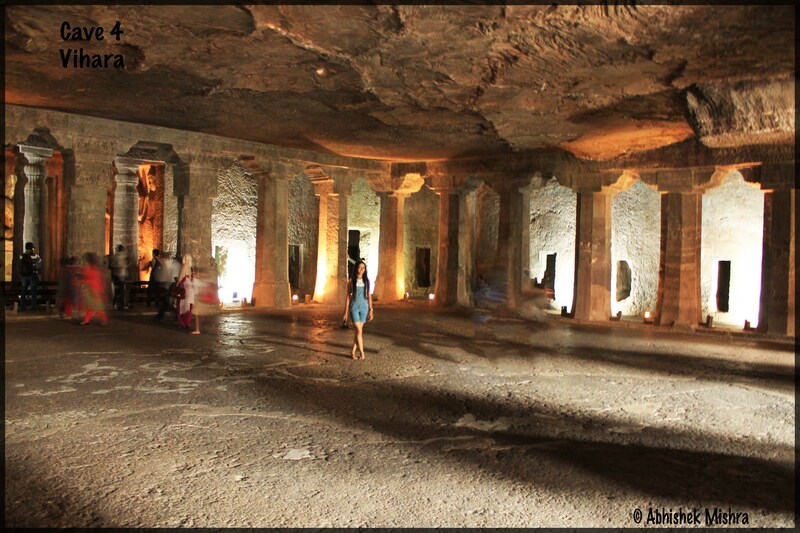 There is a specific type of lights arrangement made in Ajanta Caves for which Rs5 per group ticket has to be purchased at reception centre only. (d). Ticket price for foreigner tourist are higher. It is advised to hire a guide. There are govt authorized guide which will cost around Rs1400 for complete Ajanta Caves trip but if not individual local guides are available in each Cave. You can hire them at a prices based upon your bargaining skills. Although, we didn’t hire any guide. #Google! (a). 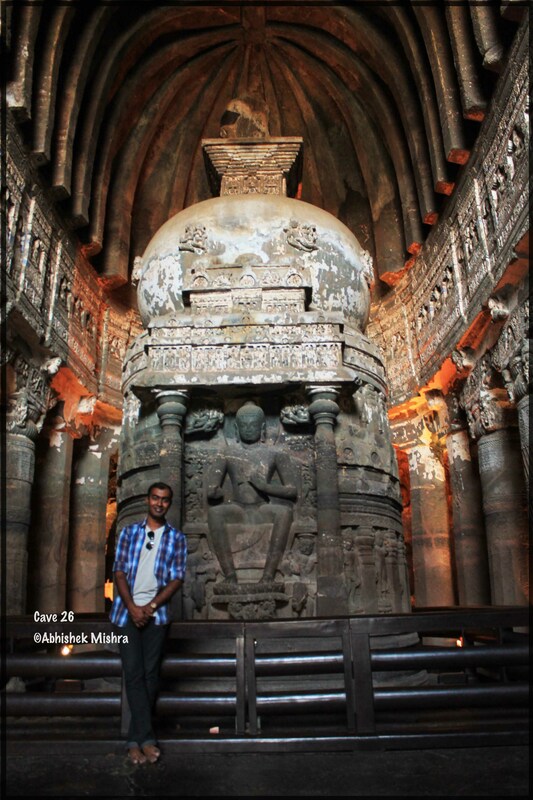 There are total 31 caves in Ajanta. It is estimated that Caves date to from 2nd century BCE. All the caves have different kinds of sculptures of Buddha. Only few caves are completely built rest all remained unfinished! (b). 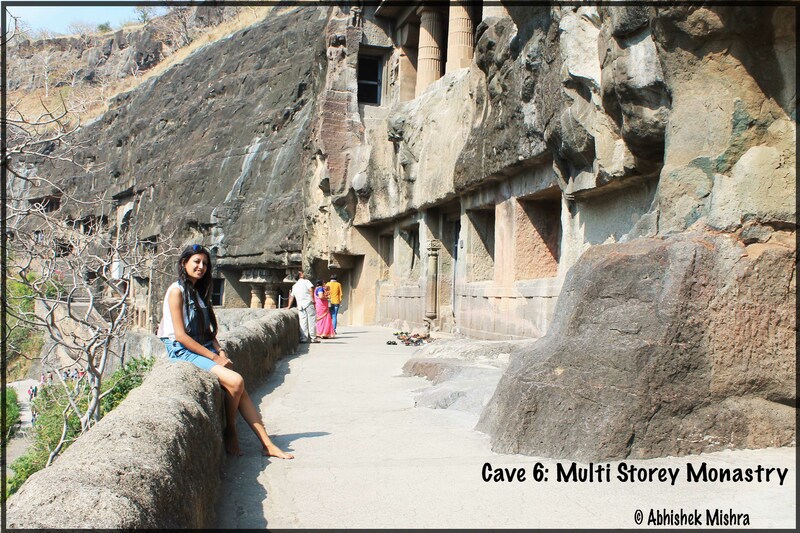 It is told that Caves were built in two phases: 2nd century BCE and later in 460-480 CE. Out of 31 Caves, Cave 16, 17, 1 & 2 are laid more emphasis upon. 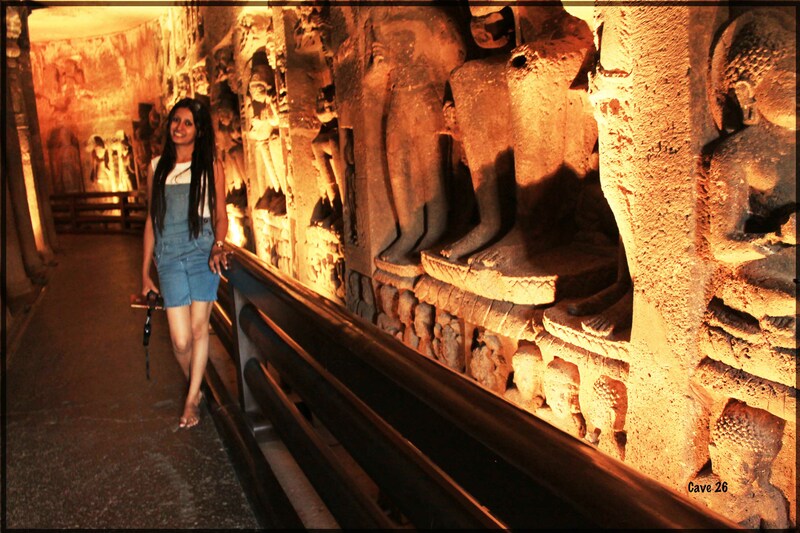 Ajanta Caves has ancient monasteries, wall paintings, prayer halls, etc carved into a 250 feet wall of rock. (c). 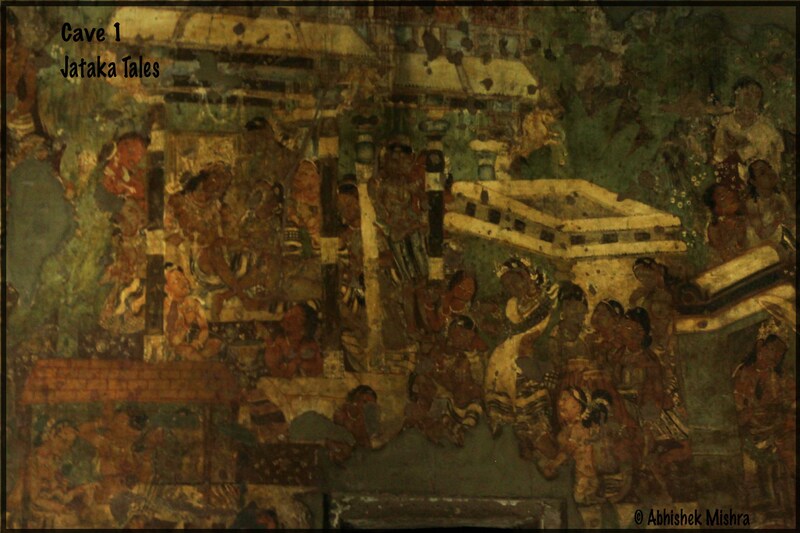 Paintings, although quite a few destroyed in excavation, depicts past lives and rebirths of Buddha, pictorial tales from Aryasura’s Jatakamala and other deities. There are few paintings in the cave which show that caves were resting sites for the monks, merchants and pilgrims. From ticket counter, there is an accent of around 500m. Carry sufficient water and eat less! 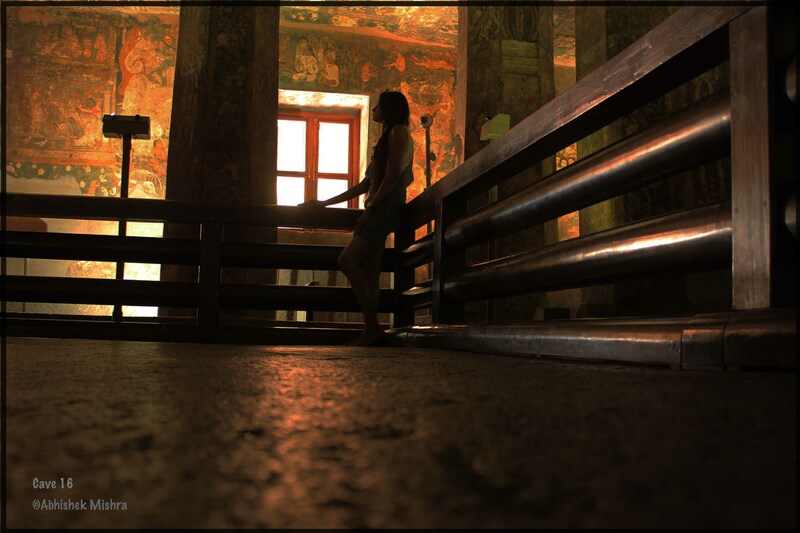 Wear comfortable foot wares as foot wares are not allowed inside the caves (best suggested are slip on foot wares). Carry sufficient camera peripherals. (a). 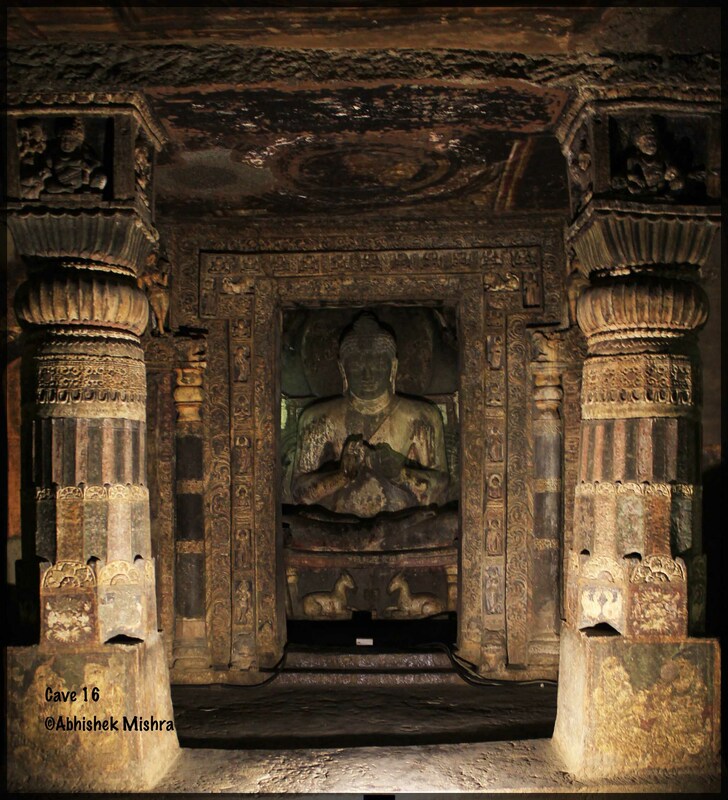 Ajanta Caves were discovered by colonial British officer John K Smith of 28th Cavalry on 28 April 1819. The officer was hunting for tiger where he discovered Cave No 10. (b). 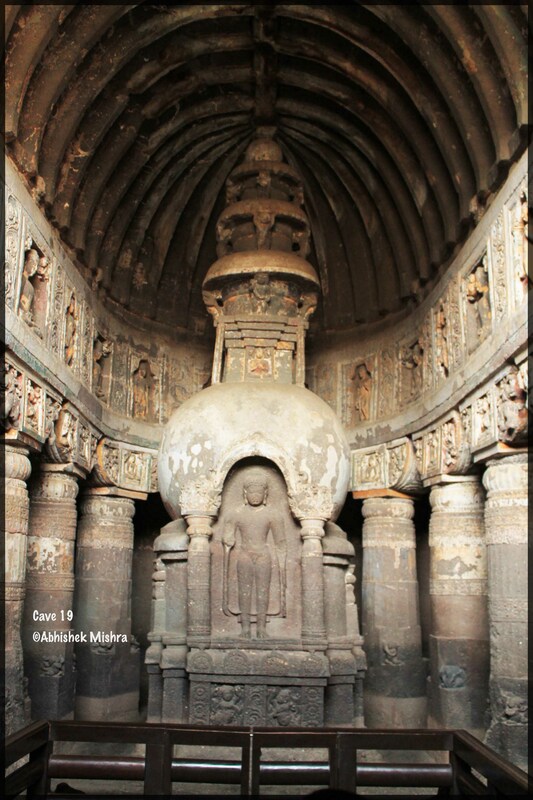 Caves are mentioned in medieval era Chinese Buddhist literatures (esp Faxian, 400CE) and also in Mughal era literature during times of Akbar in 17th century. (b). Cave No: 9, 12, 10, 13 & 16 belongs to Hinayana. Of these, Cave 9 & 10 are stupas containing worship halls “Chaityagriha” and Caves 12, 13, 16 are Viharas. (c). Caves 1-8, 11, 14-29 are based upon Mahayana of which Caves 19, 26 & 29 are Chaitagrihas and rest are Viharas. (a). Its an incomplete cave. There is feminine touch in this cave, speculated to be of women closely affiliated with then emperor Harisena who sponsored this Caave in 5th century. (b). 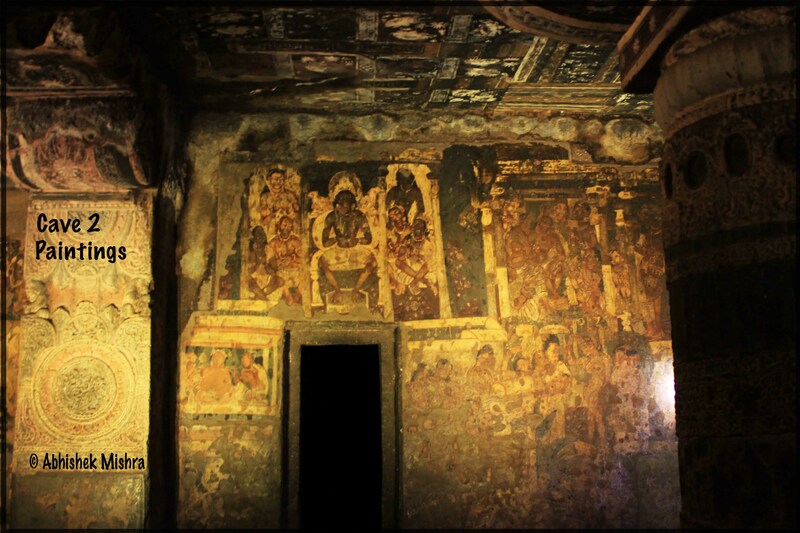 The cave has intricate carving &, paintings of children paying attention to teacher in school. (c). There is a painting in this cave of demoness of smallpox and child eater ‘Hariti’, who the Budhha converted into goddess of fertility. (a). 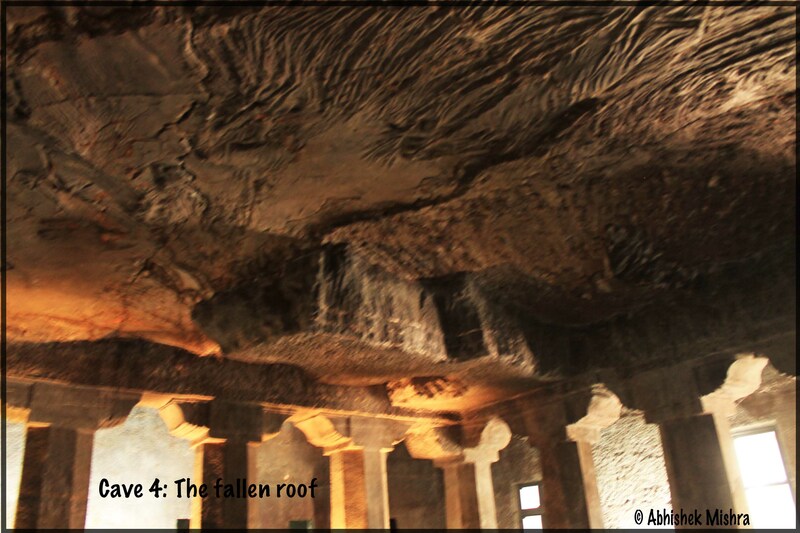 Cave No4 is the largest cave of Ajanta. (b). It was sponsored by a wealthy devotee ‘Mathura’. (c). Although the cave is incomplete but Buddha sculpture and other carvings are complete. (a). 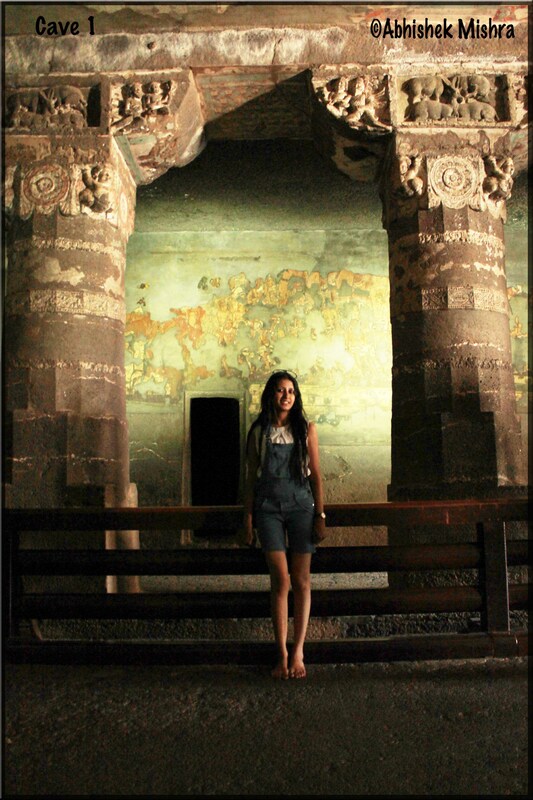 This is one of the earliest caves of Ajanta which dates back to 1st century BC. (b). 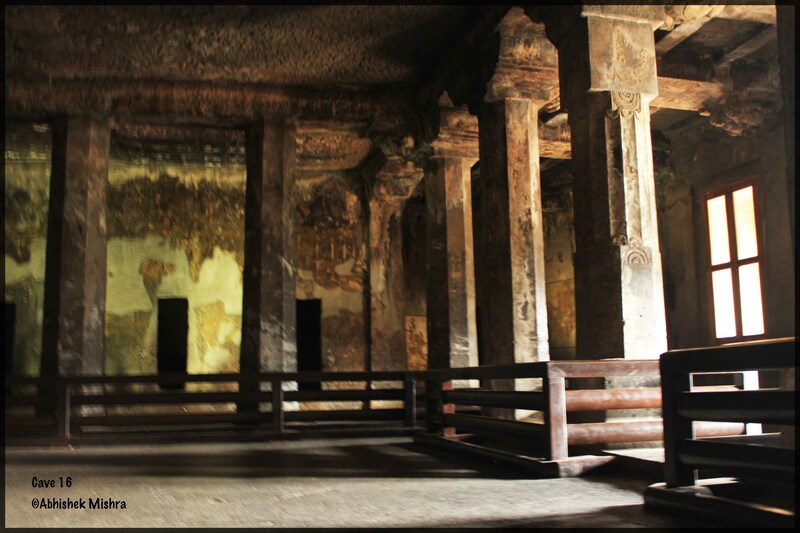 Cave-10 is vast prayer hall ‘Chaitya’ having 39 octagonal pillars. The stupa has circumambulatory path called ‘Pradakshina Patha’. (c). Cave-10 is historical as British army officer John Smith saw its arch. (a). Cave 16 is labeled as ‘Crucial Cave’ as far as Mahayana Monasteries are concerned. (b). It was sponsored by Varahadeva, a minister of king Harisena. Finally, a memorable day came to an end. We were delighted to witness the Ajanta Caves which we had just read in text books. I don’t think that visiting these caves just once will be enough to understand the significance of these World Heritages. Well, it was a tiring day. We reached back out hotel. Now it was time to look for a restaurant where we could get some good meal. We landed up in “Bhoj”. The Rajasthani food was really good. Definitely worth giving a try. Another busy Day awaits to be unfolded… Enjoying exploring Aurangabad.